Since I have now completed my Alphabet challenge I needed an idea for a mini-marathon to watch for today... this way I could finish off my weekend movie watching. I decided to go with TV Movies... 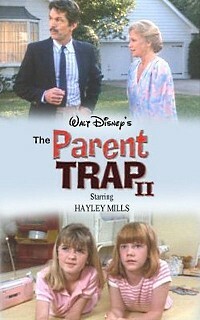 I did this mainly because I wanted to check out The Parent Trap II... which was a TV movie on Disney Channel back in 1986. Below I will be listing what movies I can watch (minus the horror movies of course). You can feel free to request a review and I will try to fit it in... but I definitely can't guarantee anything this time since I only have the one day. 13. The Dukes of Hazzard: Reunion! Going by the plot for this one I will admit I was a bit concerned. But I have to say... I enjoyed every minute of it! I really enjoyed the story... and it had several laugh out loud moments for me. I was glad to see this one being Sharon and Susan grown up and getting involved with switching instead of them trying to do the same (or similar) thing with their kids this time. I also liked that they were able to get the same actress to play Sharon and Susan. I also liked that Tom Skerritt is in this movie. I have slowly become a fan of his over the last few years. It is a pleasant surprise that I liked this one almost... if not as much as the first part. I been curios about this set since it came out. I am glad I finally added it to my collection! When I started this I saw a few I wanted to watch in the above list... Now all the sudden having difficulty in deciding what to watch next! When it's reclusive inventor is placed in imminent danger, K.I.T.T. revs into action to save him. But even though his super high-tech car is able to self-regenerate, deploy weapons, and change color and shape, it needs a reluctant ex-soldier named Mike Traceur to shift gears and help in the desperate mission. This pilot movie was included in the complete series set of the 2008 TV Series. OK... I know the popular view of this series is that it is no where near the series that the '80s version was. But you know... I have liked this one since the very first time I have seen it. Not only that... but the more I watch it (this is the 4th time I have seen the pilot movie now) the more I enjoy it! That is not to take anything away from the original version. It is awesome too. But I really enjoyed the upgraded features of K.I.T.T. and I liked the characters as well as the storyline. After watching this pilot movie today... I feel like I could watch the entire series again. One thing that did bug me about this one though. In the pilot movie they never used the Turbo Boost. You would have thought that would have been a must for the fans of the original. I remember when this originally aired that because it wasn't in (or even mention in) this pilot movie that I was afraid they dropped that all together. But thankfully it was in the series. I was also surprised to see a Special Guest Star credit for David Hasselhoff early on in the credits since he was really only on for a cameo appearance. Really only the matter of 30 seconds to a minute. I also noticed that in this pilot movie they made it very clear that Sydney Tamiia Poitier's character, FBI Agent Carrie Rivai, is a lesbian... which if I am remembering correctly... is something they totally dropped from the actual series. I also noticed that in this pilot movie they made it very clear that Sydney Tamiia Poitier's character, FBI Agent Carrie Rivai, is a lesbian... which if I am remembering correctly... is something they totally dropped from the actual series. Yes, sadly. And then they dropped the character altogether after the first batch of episodes. I wonder if the character would have been more interesting and worth to keep around, if they would have kept the lesbian aspect. Maybe... and then they could have done a love triangle between Mike, Sarah and Carrie. Well... I decided I am loosing my desire to continue with movies after watching so many in the last week and a half. It is time for me to work on some of my TV Series again!